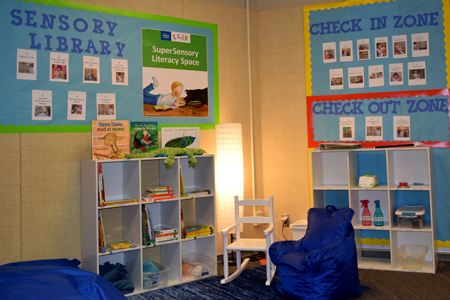 Portland Public Schools’ regional Head Start has new tools to help preschoolers with disabilities focus and engage in the classroom, with a SuperSensory Literacy Space created by The Shadow Project. The Shadow Project-designed sensory space at Clarendon Regional Early Learning Academy is the first of its kind in a Head Start. 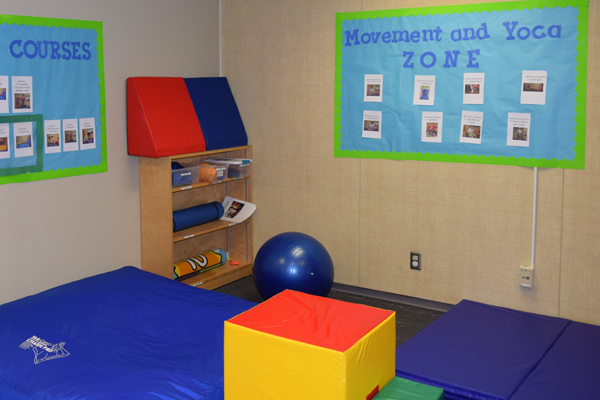 The space is now in use for a handful of students, and is designed to meet childrens’ three biggest sensory needs: big movement, heavy work, and deep pressure. “Our teachers came up with the idea of a sensory space as a need,” said Susan Fodell, M.S., disabilities manager for Portland Public Schools Head Start. “Because of their interest, we reached out to The Shadow Project. The Shadow Project worked hand-in-hand with Clarendon’s occupational therapist Jessica Wade to tailor five zones that meet the school’s three biggest sensory needs. “Some kids need large movement and heavy work activities in order to be able to learn,” said Wade, early childhood specialist with the David Douglas School District. “Having access now to these tools and space will make a difference in their ability to focus and engage in the classroom. The Shadow Project trained Clarendon educators on how to use the space in late fall, and developed a step-by-step manual for how to use the zones (check-in/check-out, manipulatives and fidgets, work table, sensory library, and obstacle courses) and accompanying tools. Clarendon is The Shadow Project’s first foray into early childhood education.